Want a show-stopping dessert that doesn't take much time to prepare? That would be this delicious Dulce de Leche Bread Pudding with Peanut Brittle Topping. Toss bread with apples in large bowl. Blend eggs, milk, dulce de leche and cream cheese in blender until smooth. Pour over bread mixture; toss to evenly coat. Spoon into 13x9-inch baking dish sprayed with cooking spray. Bake 45 min. or until knife inserted in center comes out clean. Cool 20 min. Meanwhile, cook sugar in small nonstick skillet on medium-high heat until golden brown. Stir in nuts. Pour onto foil-covered rimmed baking sheet. Carefully separate into small pieces with back of spoon. Cool completely. 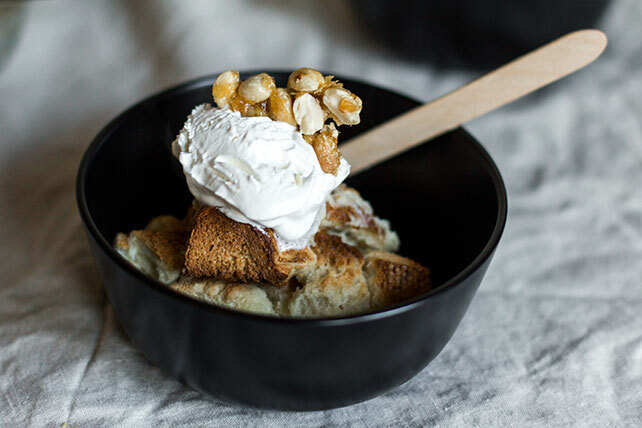 Serve warm pudding topped with COOL WHIP and nuts. Enjoy a serving of this delicious bread pudding with loved ones, but be sure to keep an eye on portion size. This delicious pudding can be mixed together ahead of time. Refrigerate up to 8 hours before baking as directed. Leaving the crust on the bread adds both color and crunch to this flavorful pudding. For a softer pudding with smoother consistency, remove the crust from the bread before cutting into cubes. Regardless of how you prepare the bread, the final result is equally delicious.